You can have Bill's photo of the day come directly to your email by signing up at the bottom of his blog. To suggest additional topics for this blog, if have questions, or if you want to buy a house in Frederick County, e-mail darcy@thebuyersbest.com or call 301/524-3676. Have fun in Frederick! As I was walking through Baker Park this morning, I happened to see Samet Caliskan doing a flip. I asked him what he was doing. He told me that he is part of the Frederick Maryland Parkour & Freerunning community that meets every Saturday in Baker Park at 11:00 am. The group has over 100 members, and about 10 -15 show up for any particular "jam." Today, 11 boys came to the park for action as shown in the photo at right: Ben Price, Scott Hasenbuhler, Matthew Bates, Ivan Maldonado, Wyatt Schweitzer, Alex Deifel, Chase James, Kyle Austin, Aron Strong, and Aaron Deifel. Samet Caliskan, whose roundoff to flash kick is shown below, is seated on the left. What is Parkour? The American Parkour website defines it as: "the physical discipline of training to overcome any obstacle within one's path by adapting one's movements to the environment." Wikipedia says: "Parkour is a training method which focuses on rational movement in both the natural and urban environments. The focus is to move around obstacles with speed and efficiency....the main purpose of the discipline is to teach participants how to move through their environment by vaulting, rolling, running, climbing and jumping." 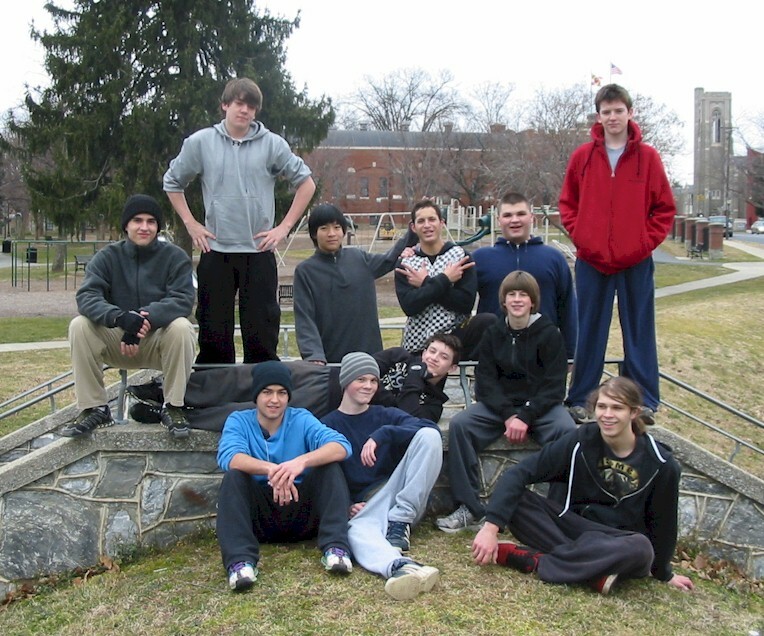 You can see this group's Parkour videos on YouTube http://www.youtube.com/watch?v=IYb30-om8aI. And another at http://www.youtube.com/watch?v=t6jfDqRG_SM I can tell you it is a wonder to watch. I asked Samet to do a flip for the blog, shown below.